WHAT CAN WE LEARN FROM A BUCKLE? In a recent blog entry we examined characteristics of a 5th-6th Century Frankish cloissone’ silver buckle, a high status object. In this entry we will examine aspects of some rather more mundane but also much more typical buckles from Late Antiquity and the transitional period involving the migration of peoples into Europe, the end of Roman authority in the west and the consolidation of Roman power in the east (the Byzantine Empire). A group of 5 Visigoth bronze belt plates in our online shops, found in Spain and formerly in both an old Spanish and a California private collection, date to the 5th and 6th Centuries. By the early 6th Century, what is now the Iberian Peninsula was no longer part of the Roman world but largely under the control of the Visigoth Kingdom. The material culture and art of the Visigoths, their close relatives the Ostrogoths and Heruli, and other migratory people who settled in the former European provinces of the Roman Empire, focused on small, finely crafted objects, including jewelry and articles of personal dress. Such objects made from precious metals and adorned with cloissone’, gilding and other high status techniques tend to receive much attention in museum exhibitions and catalogs but these are not typical. 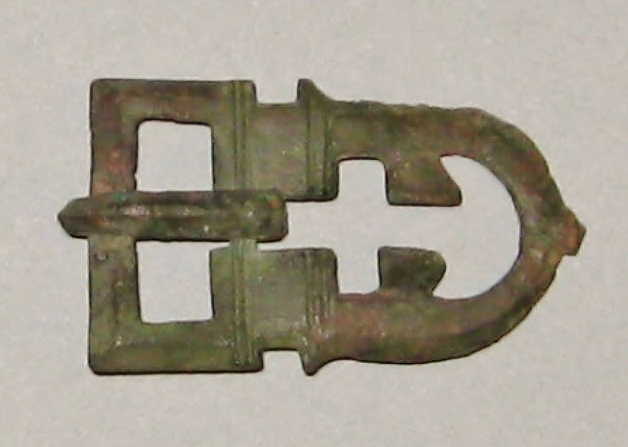 Most personal dress items, such as the buckles listed here, were crafted from bronze or iron and decorated with simple incising or chip carving. Some common iconographic themes among all these objects include bird heads with large beaks, presumably raptors, and quadra pedal animals, usually quite stylized and sometimes nearly impossible to make out amidst a mass of contorted ornamentation. Viewing a close up of our group, the small belt plate in the center is a good example of the large beaked bird motif. 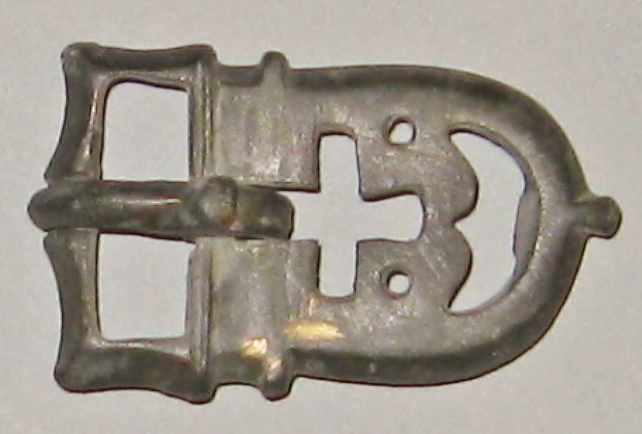 The 2 buckle plates on the left clearly portray animals of some type but any specific identification is impossible. The buckle 2nd from right may include both animal and bird elements but these are far less distinct than on the other plates. A very clear related example of the beaked bird motif may be seen here (http://www.britishmuseum.org/research/collection_online/collection_object_details.aspx?objectId=95393&partId=1&searchText=Byzantine+buckle&images=true&&page=1 ) on 2 mounts with all-over cloisonné garnet inlays in the Metropolitan Museum of Art, NY, dating to the late 4th-5th Century, found at Kerch in the Crimea. Buckles provide a remarkable insight into the transition of the formerly Roman European provinces into the semi-Barbarous states established by the now settled “Migration Period” peoples. In the later days of Roman control in western Europe, specifically the late 4th and the 5th Century, very large numbers of officers in the Roman army were of “barbarian” extraction, some rising to very high office. Increasingly, the weapons and objects of personal adornments used by Roman troops and their non-Roman opponents converged in terms of materials, effectiveness and even decorative treatment. To illustrate the point, a late Roman (4th-5th Century) chip carved buckle in the British Museum (http://www.britishmuseum.org/research/collection_online/collection_object_details.aspx?objectId=86295&partId=1&searchText=Roman%20chip%20carved%20buckle) shows a remarkable similarity in its surface treatment, which is chip-carved, to a Germanic, possibly Gepid, chip carved buckle, also in the British Museum (http://www.britishmuseum.org/research/collection_online/collection_object_details.aspx?objectId=85657&partId=1&searchText=Germanic+buckle&images=true&page=1). This convergence of styles was far less pronounced in the eastern provinces of the Empire – what we now call the Byzantine Empire (though the Byzantines themselves would not have understood this term, as they simply thought of themselves as Romans). A couple of complete belt buckles we offer, cast in the “cross and pelta” style, illustrate this. These show no hint of influence from the migratory cultures that had overrun the west. Their clean and solid lines suggest stability and authority. Far wealthier than the western provinces, and with central authority concentrated at Constantinopolis, the east was able, for the most part, to stay out of the chaotic relationships among the new semi-barbarous European kingdoms, and even to repel onslaughts from other migratory groups in the east, such as the Slavs, Avars, Alans and Huns.